Safer at night. Two design students at Carnegie Mellon University created a functional and graceful lighting system for bikers that enhances side visibility at night. 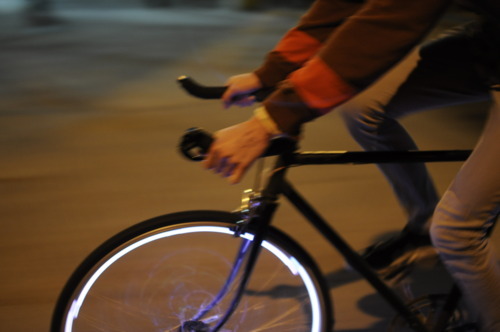 The LED lights that line the wheel rims, are powered by pedaling and change colors depending on speed. Bloggers at Greater Greater Washington have posted a video of the lights in action. Convenient Cities. What makes a city “convenient”? According to a study published by The Street, factors include walkability, public transportation, and amenity proximity. Their city ranking, using data from Walk Score, Zillow and APTA, put Boston, New York, Denver, Portland, and Chicago at the top. Olympic Pollution. A documentary by filmmaker Faisal Abdu’Allah, Double Pendulum, examines the harmful effects of pollution on East London residents and athletes, The Guardian says. Abdu’Allah cautions that poor air quality in East London may threaten athletes’ performances in the London 2012 Olympic Games. Designer Chocolates. PSFK reports that researchers in a joint program between the University of Exeter, the University of Brunel, and Delam, a software developer, have created a printer that turns 3D CAD designs into ready-made chocolates. An upcoming retail site will allow the public to upload original designs.